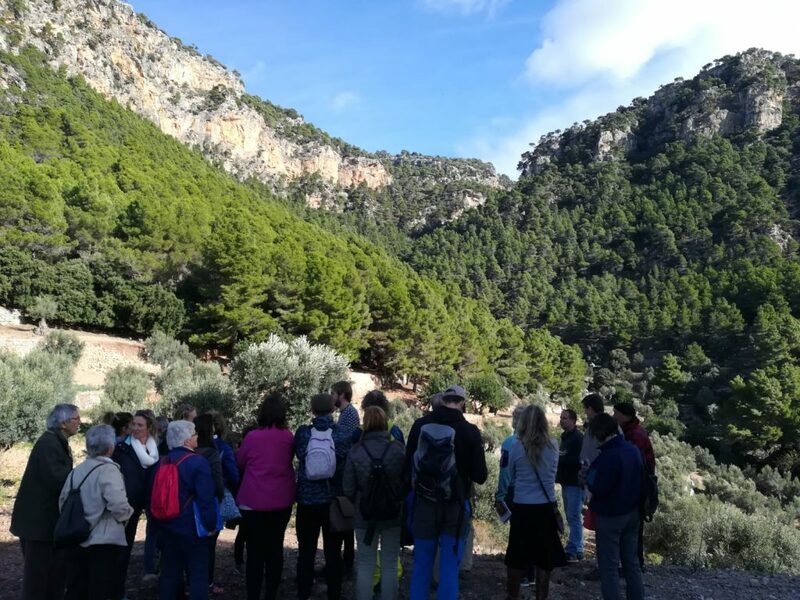 Towards the end of 2018, fifteen German tourists and five volunteers from Amics de la Terra Mallorca spent the day working together in the Biniaraix ravine (Barranc de Binaraix) with in-situ explanations about the natural and cultural heritage of the Serra de Tramuntana. They learned the technique and helped to restore a stone wall with the guidance of a professional dry stone-wall mason, locally called “marger” (the president of the Guild of Margers of Mallorca), getting a unique understanding of the hard work that this artisanal construction implies. 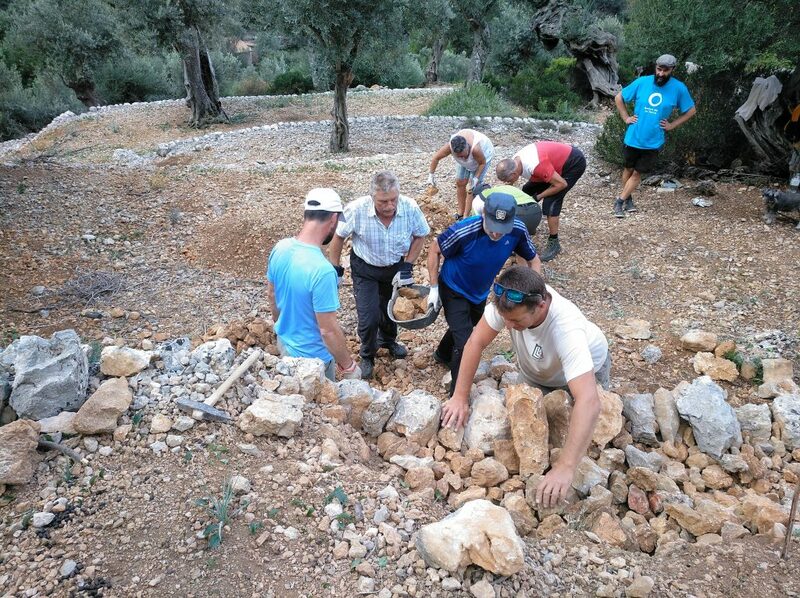 It also gave a hands-on opportunity to actively help in the environmental recovery of olive groves and dry-stone walls which form the outstanding manmade landscape of the Serra de Tramuntana. The tasks were similar to the previous two workshops (October 2017 & April 2018), as the need for conservation is still a priority: restoration of the dry-stone walls and recovery of the olive grove by removing invading vegetation in several terraces such as those of Can Cati and Can Silles. In this third session, the participants were also able to enjoy a local after-work lunch in Ca’n Gori, with unique views of the ravine and surrounding mountains. Through these outdoor activities, Amics de la Terra Mallorca aims to improve the tourists’ environmental awareness by appreciating the importance of the conservation and the difficulties to preserve this landscape, declared World Heritage by UNESCO under the Cultural Landscape category since 2011. Some good news is that at the end of November 2018, the art of dry stone walling, knowledge and techniques, have also been included in the Representative List of the Intangible Cultural Heritage of Humanity by UNESCO. This bigger project will extend until spring 2019, and includes not only these active volunteer working days, but also a directory of products from the Serra and their selling points (there will be a specific website about this directory very soon); a survey directed at German hikers in the Serra (https://www.amicsdelaterra.org/en/results-of-an-environmental-survey-amongst-german-hikers-in-the-serra-de-tramuntana/); a First Edition of Training Sessions for Mountain Guides (https://www.amicsdelaterra.org/en/biodiversity_en/first-training-session-for-mountain-guides-on-the-serra-de-tramuntanas-natural-and-cultural-heritage/); and a number of school workshops about the conservation of the Serra carried out together with the Balearic Association of Mountain Guides (addressed at future professionals still under training). 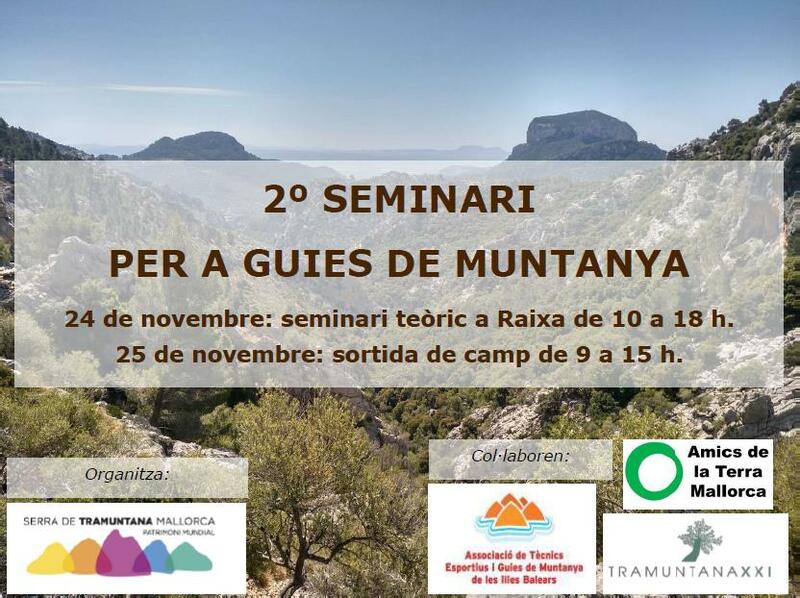 After that successful first edition of the Training Sessions for Mountain Guides in June 2017, Amics de la Terra Mallorca co-organised the Second edition of Training Sessions for Mountain Guides this November 2018, supported this time by the Serra de Tramuntana Consortium of the Council of Mallorca, and in collaboration with the Sports and Technicians Association of Mountain Guides of the Balearic Islands and the association Tramuntana XXI. During those training sessions, which had one day of theory and debates and a second day of field trips visiting initiatives in situ, around forty mountain guides got involved. This second edition was more focused on the agriculture and farming development in the Serra de Tramuntana and was especially interesting since this particular landscape has been modelled by traditional human agricultural activity, which nowadays is unfortunately dying out. To have economically viable crops and farms in this area is a real challenge, along with generational changes and other aspects from climate change to lack of government support to help with funding for those entrepreneur initiatives in the Serra. Just recently the Majorcan Council has approved a specific label for products of the Serra de Tramuntana which hopefully will contribute to improving their sales and consequently the recovery of agriculture in the region. 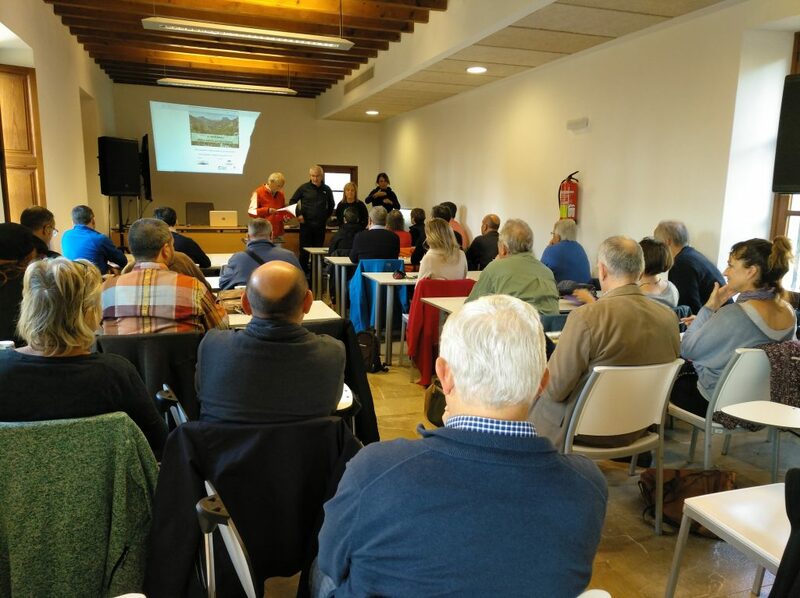 The group visited a traditional wine cellar (Son Vives) in Banyalbufar, a property with olive oil and marmalade production (Son Moragues) in Valldemossa, and finally the farmers’ cooperative of Son Bartolomeu in Sóller with its interpretive centre (Centre Capvespre). In these visits, the mountain guides enjoyed the local products, and were given a brief explanation of the importance of maintaining these farming activities, not just for those families who make a living out of them, but for the conservation of a beautiful landscape, which we can all enjoy and which is the reason foreign hikers visit it, some of them using the services of trained mountain guides.